A homeless man, Steven Emory Butcher, was found guilty for starting the longest burning wildfire in California state history. The Day Fire burned more than 162,000 acres in the Los Padres and Angeles National Forests in 2006. They also found him responsible for the Ellis Fire near Lake Piru in 2002. California, with its dry desert hillsides, steep lush canyons and oak lined valleys, is a haven for seasonal wildfires. Campfire restrictions could be higher in the later months (July-Dec). Many Southern California parks & forests place extreme campfire restrictions on the wilderness backcountry camping, for primitive campsites on remote back roads - and sometimes even inside developed campgrounds. If you cannot imagine camping without a campfire, then make sure of the conditions before you head out. 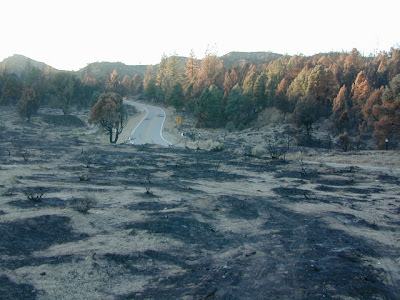 Prescribed burns are commonplace around the western US to control the amount of brush buildup on the forest floors. Fire crews may be out working, any day and during any season, and they often erect roadside signage for curious motorists. If controlled burns are in effect, certain roads and areas will be closed off to public use. If in doubt, you can call the local rangers, or stop by the ranger station for the best info. See more on how to keep your campfire safe!